Photo & travel blogs of Paul & Mylinh Vo. In previous trip to Central Europe, I made brief stops in Bratislava. 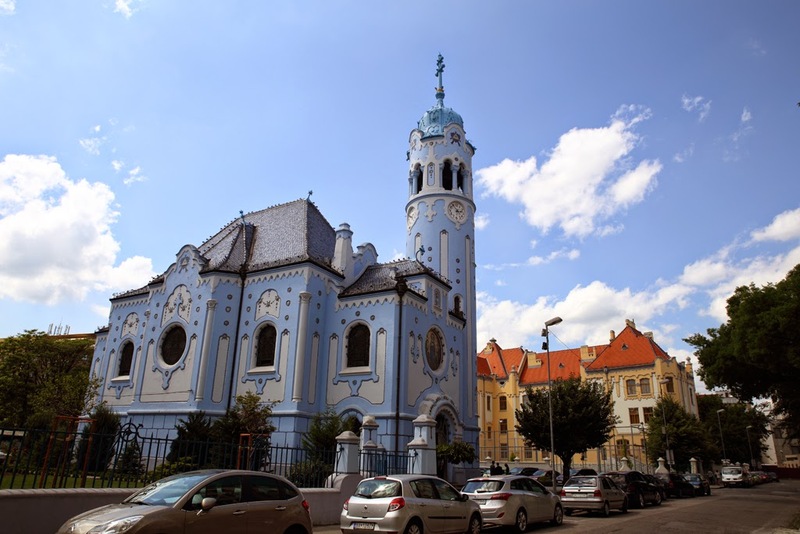 My longest stay in the capital of Slovakia was in early December 2013. The weather then was brutally cold. I did not venture out much. 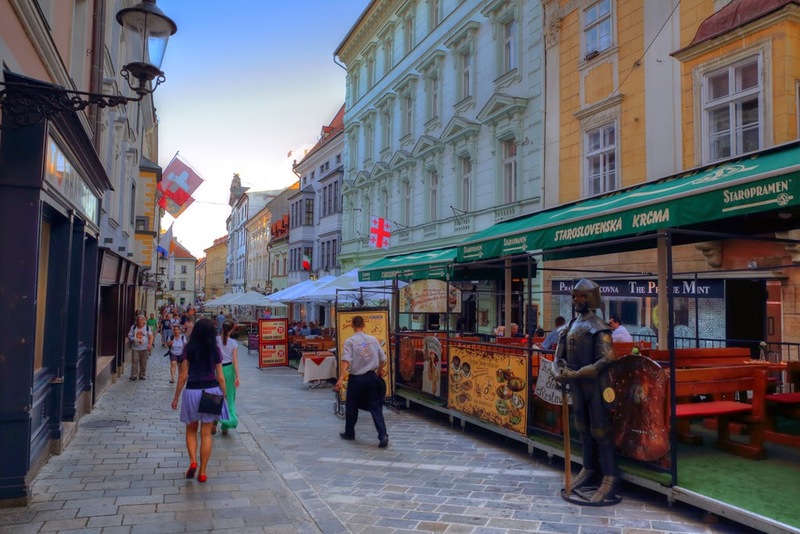 So it was with a renewed sense of excitement that I received another chance to return to Bratislava in a warmer season. But this trip also meant having to say goodbye to dear friends prematurely. Beautiful clear sky welcomed me to the capital of Austria. 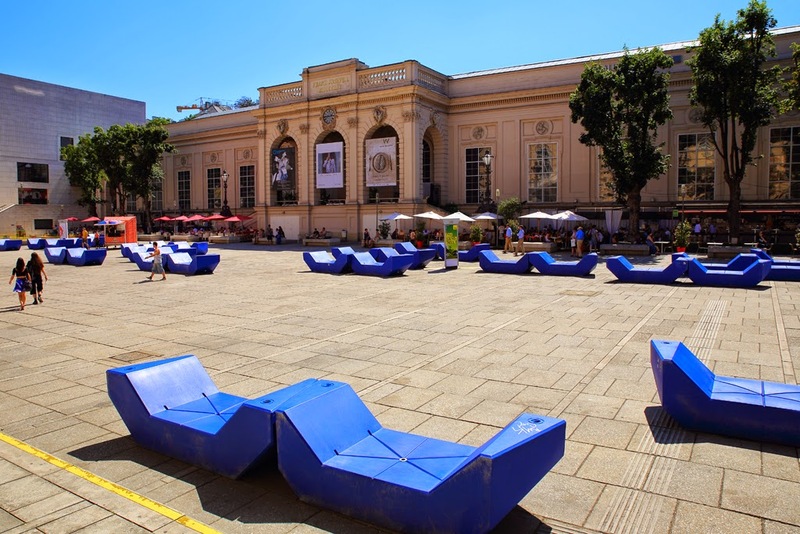 A visit to downtown Vienna for lunch and a self-guided walking tour afterward. The weather was surprisingly hot; maybe too hot for this part of the world. 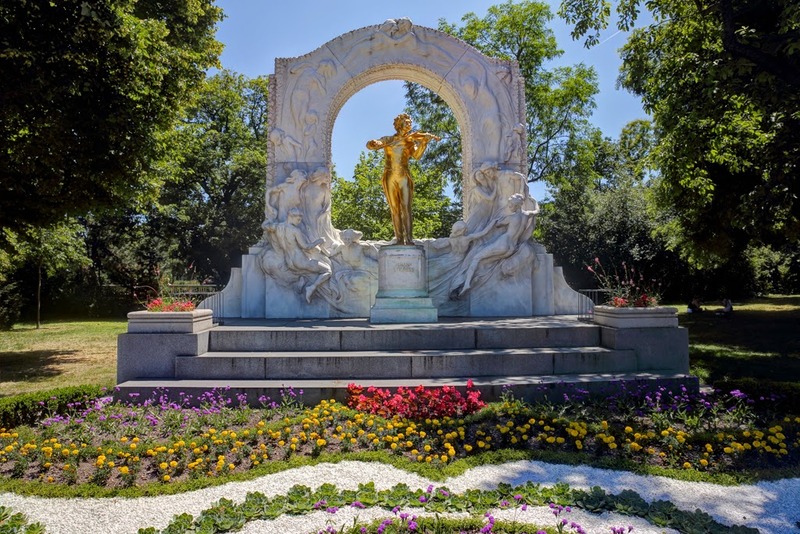 Johann Strauss, king of the waltz. Bratislava greeted my arrival with a clear and pleasant evening. Like in any large city in Europe, walking and taking public transportation were the best way to get around than driving a personal car. Finding a parking spot would be difficult and, probably, expensive. The streets of old downtown were for pedestrian only, making a promenade enjoyable. There were restaurants, shops and boutiques throughout. 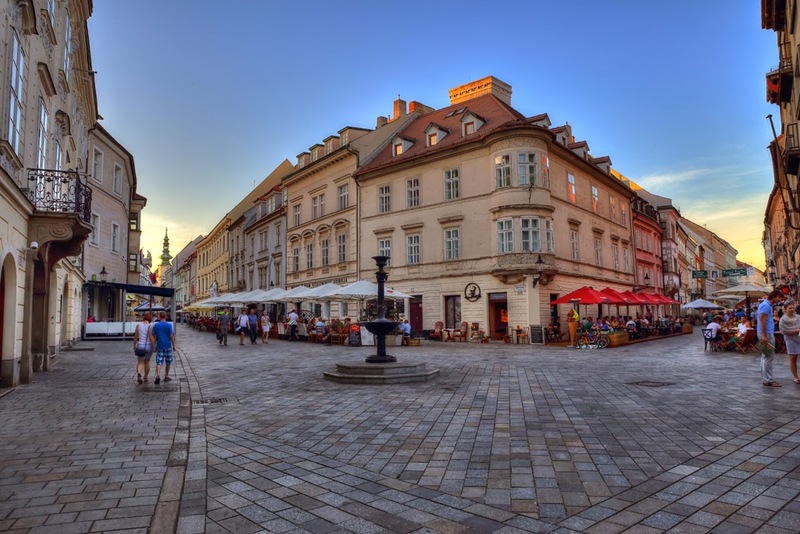 Historic downtown of Bratislava, Slovakia. 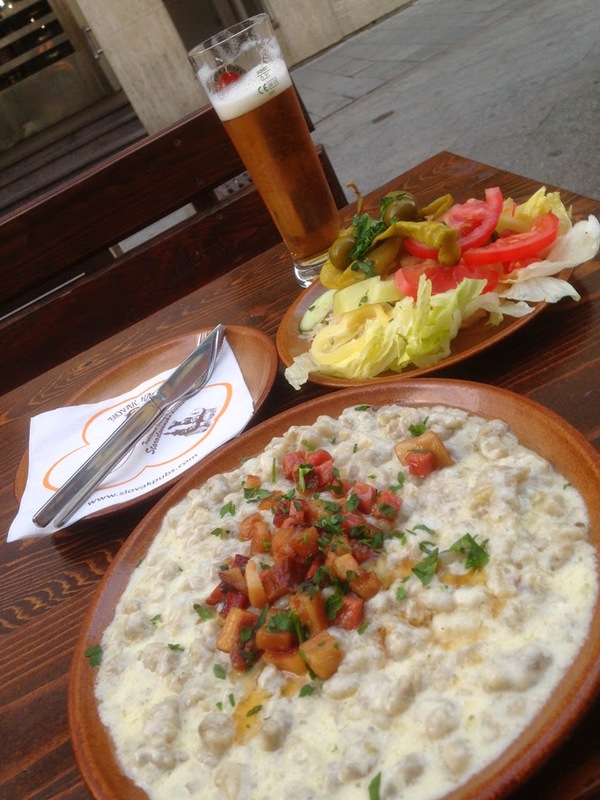 While my days were taken up by work, my evenings were spent sampling many restaurants which advertised traditional Slovak cuisine. A few restaurants have very nice live music entertainment. One evening, there was a fashion in the middle of old town square, featuring a local designer. Bryndzové Halušky is a national Slovak dish. Fashion show in old town Bratislava, Slovakia. Again the airline regulations require me to stay over a Saturday to qualify for a deep discount. 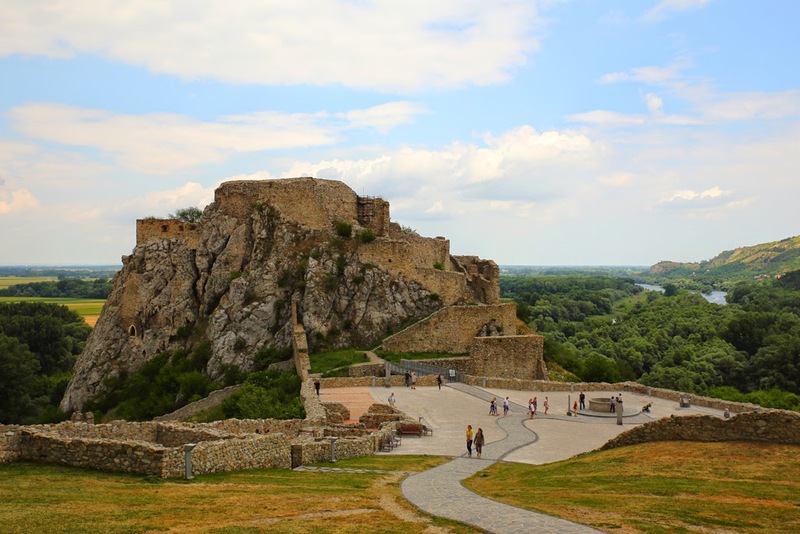 The first morning of the weekend was spent visiting the Hrad Devín, a fortress just West of Bratislava. I was surprised by the large nearby sculpture depicting a prison breakout. Its backside is filled with bullet holes and its metal bars are bent "outward. 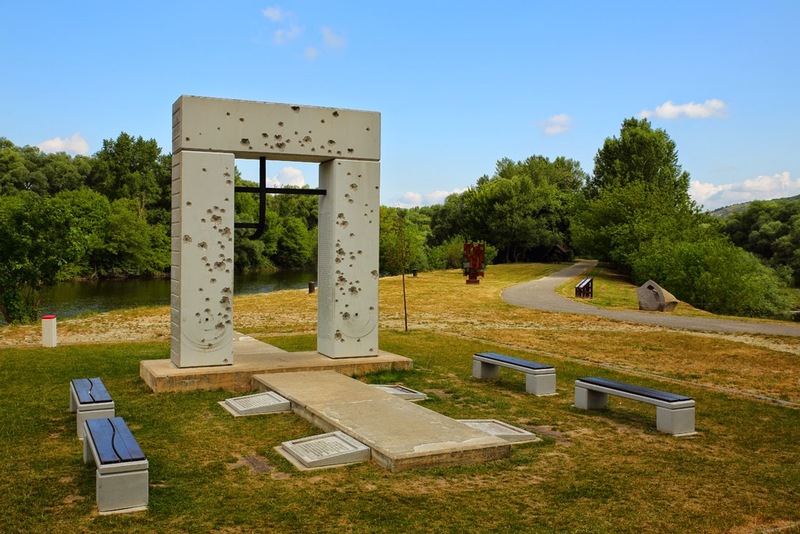 This sculpture is a powerful and moving memorial to the people killed trying to break through the "Iron Curtain" in hope of reaching Western Europe. Gate of Freedom Memorial in Devín, Slovakia. Hrad Devín near Bratislava, Slovakia. The rest of day was for more exploration of the Slovak capital on foot. Its parks were full of people enjoying the beautiful summer weather. I found the Blue, also known as St. Elizabeth, Church. It is a small but charming church. There was a beautiful wedding in progress when I was there. So I could not photograph much. I took the chance to go up the UFO restaurant at the top of the "New Bridge". 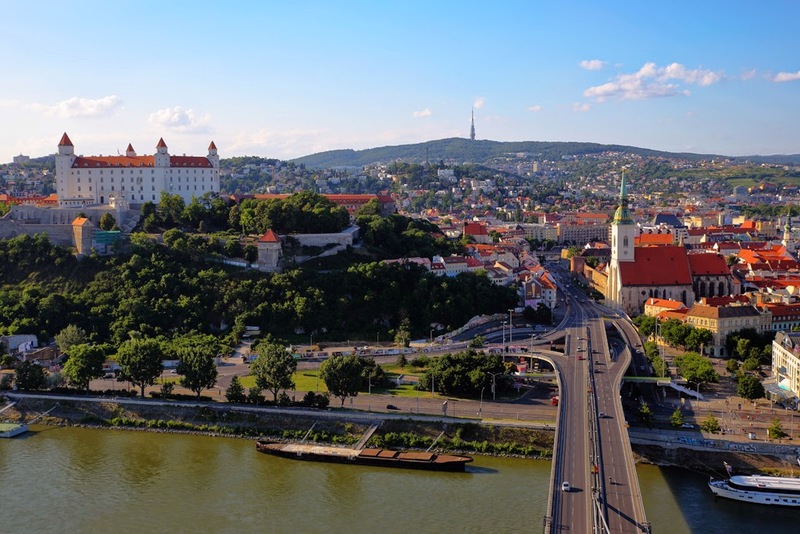 The view of Bratislava from that vintage point is indeed breathtaking. 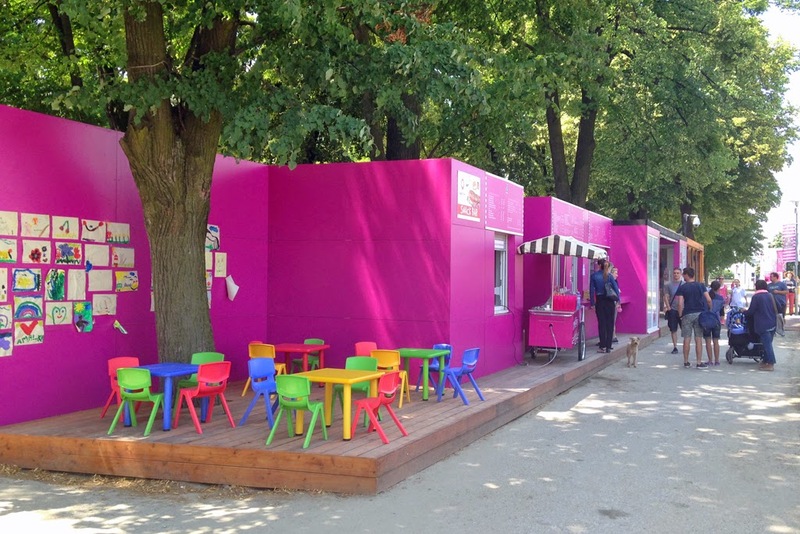 Colorful furniture and stalls for children at a park in Bratislava, Slovakia. Kostol svätej Alžbet, also know as St. Elizabeth Church. This trip to the charming capital of Slovakia could not be possible without the hard work of my colleagues to make it a reality. A few more pictures are at https://picasaweb.google.com/108013863525571472697/140608WienBratislava#. Also a collage of some of these pictures can be found at https://plus.google.com/u/0/108013863525571472697/stories/276a0d3a-7fb1-396b-9063-f74aefc43485147a12e6c9e. As customary, your comments and critiques of my blog and pictures are solicited to help improve my skills. And until next time, I bid you a great day and a safe travel. After a couple of very quick business trips to Southern and Northern California, it was time for a vacation. It was as much a rest period as one to celebrate the accomplishment of a "niece" and her parents. Six years ago, the daughter of very good friends expressed her desired to come to the United States to study. She started her student career near New York City, then moved to Phoenix to be with us. After completing her high school degree, she attended Arizona State University. This May, she graduated with honors from the college of business. Her parents joined us to celebrate her accomplishment, the culmination of their tremendous sacrifices and her great effort. The day after attending the graduation ceremony of their daughter, our dear friends flew with my spouse and me to Miami, Florida. A strong storm over our destination diverted our aircraft to Fort Myers to wait it out. We landed at our original destination about 2 hours late. Our son and his lovely wife waited patiently and joined us for a very pleasant dinner. 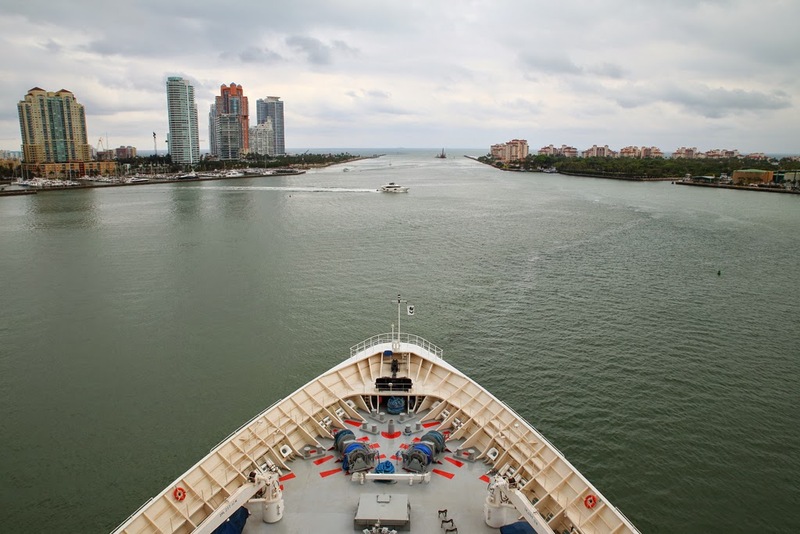 The next day, we boarded a cruise ship from the port of Miami for a 4-day trip to Coco Cay and Nassau, Bahamas. The lingering thick clouds of the storm of the previous day made the departure a bit less than festive. 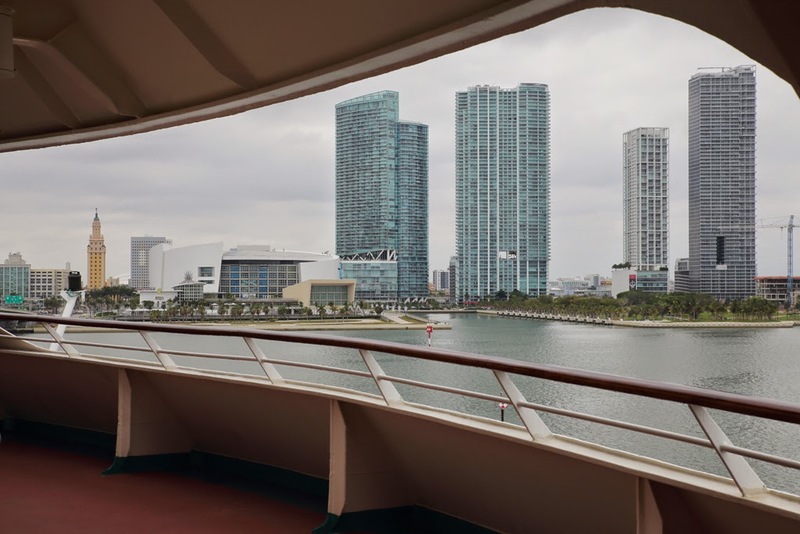 Miami, Florida, viewed from cruise ship. Our arrival at Coco Cay, a small island about 55 miles (88.5 km) north of Nassau, Bahamas, was greeted with rough sea, a condition left over from the storm two days before. It forced the captain of the cruise ship to cancel our excursion to shore. 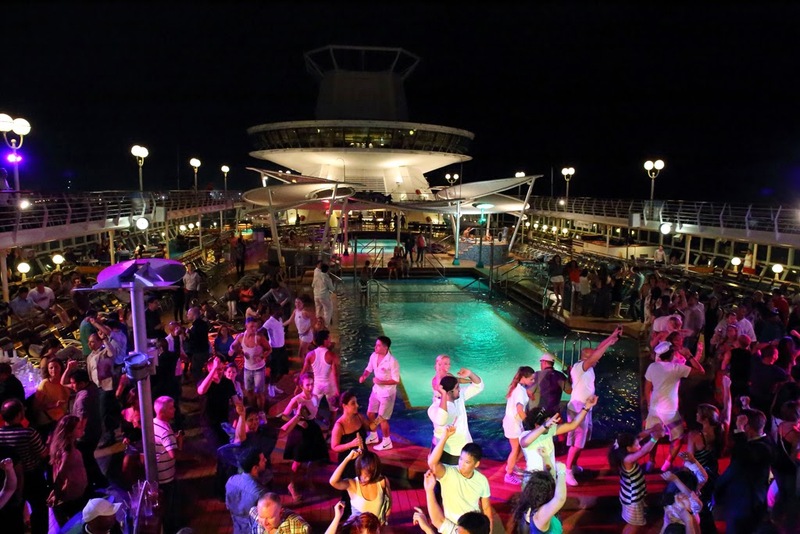 This extra day at sea gave my wife and me the chance to spend quality time with our friends, learning more about their trials and triumphs, all the while enjoying the variety of foods and drinks aboard. 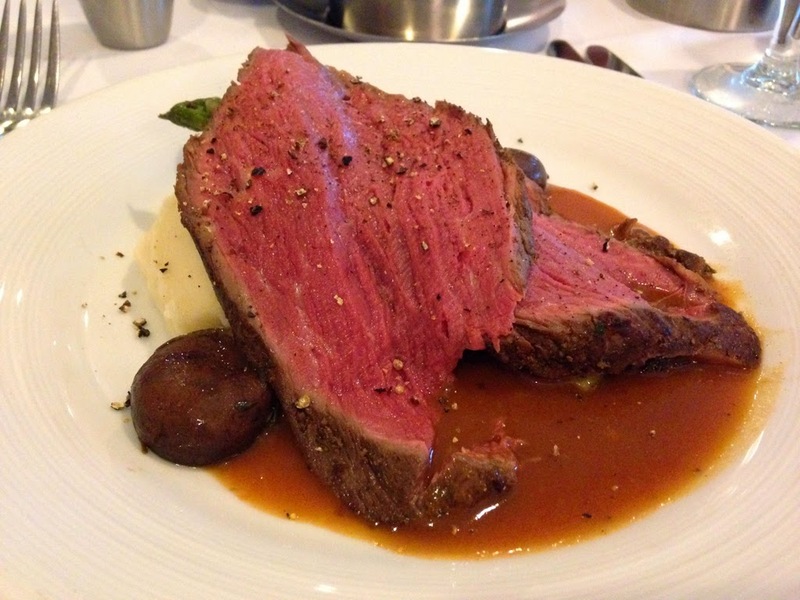 Dinner on board cruise ship: Perfectly grilled tri-tip steak. The capital of The Bahamas welcomed us with superb weather. We visited its Straw Market and walked along many streets in downtown Nassau. We took a water taxi to Paradise Island to enjoy its many amenities and sandy beach. The sea with its ideal temperature was pristine. The high waves, a residual effect of the storm several days ago, were actually fun. Upon our return to Florida, we picked up our new graduate and checked into a rental condominium. It had a gorgeous view of Miami. We spent a few perfect days there, exploring the nearby beach and the Art Deco District, enjoying the local cuisine and night life. We also had a delightful lunch with our son at a beach resort in Fort Lauderdale, Florida. Beach at Fort Lauderdale, Florida. 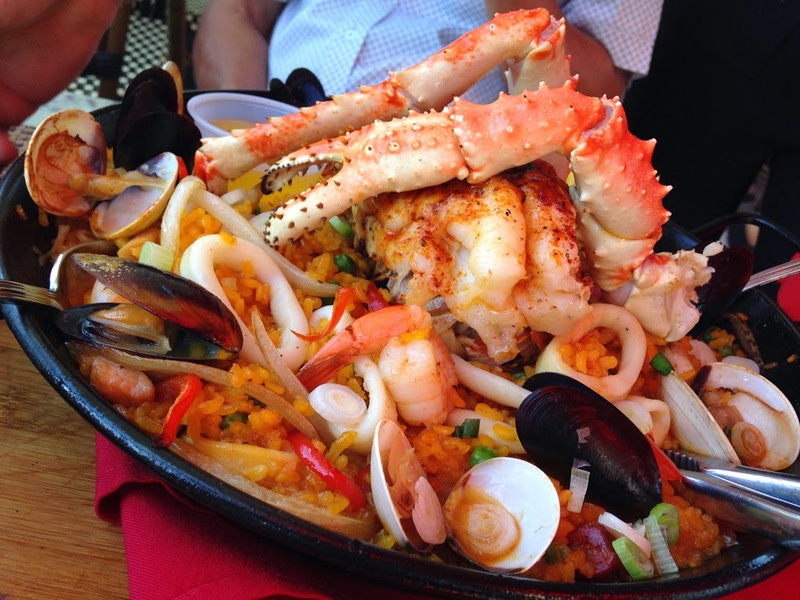 Seafood Paella in Art Deco District of Miami Beach, Florida. Jacksonville in Northern Florida was our next vacation spot. It was a very peaceful town. We went to see the Timucuan Ecological and Historical Preserve, which included Fort Caroline. Its fascinating history illustrated on several story boards. The Cummer Museum of Art & Garden was our next stop. Its theme gardens were indeed very nice, and the collections of art and artifacts were varied and interesting. 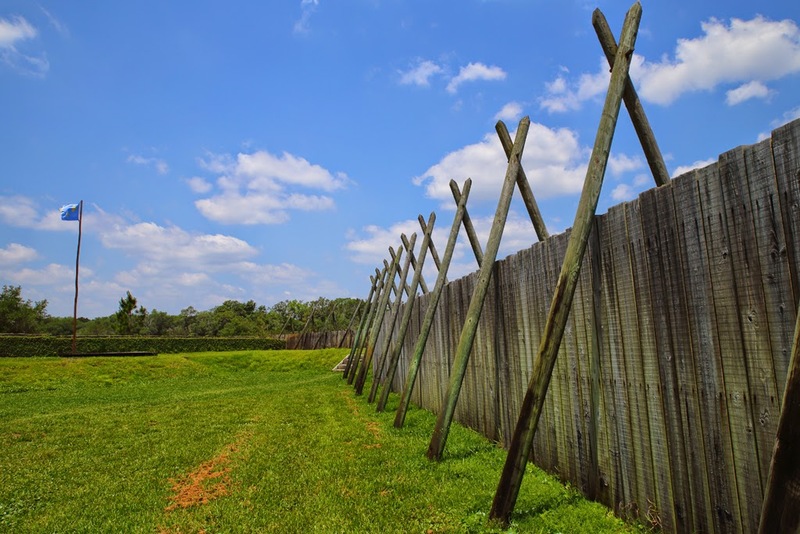 Fort Caroline National Memorial at the Timucuan Ecological and Historic Preserve in Jacksonville, Florida. 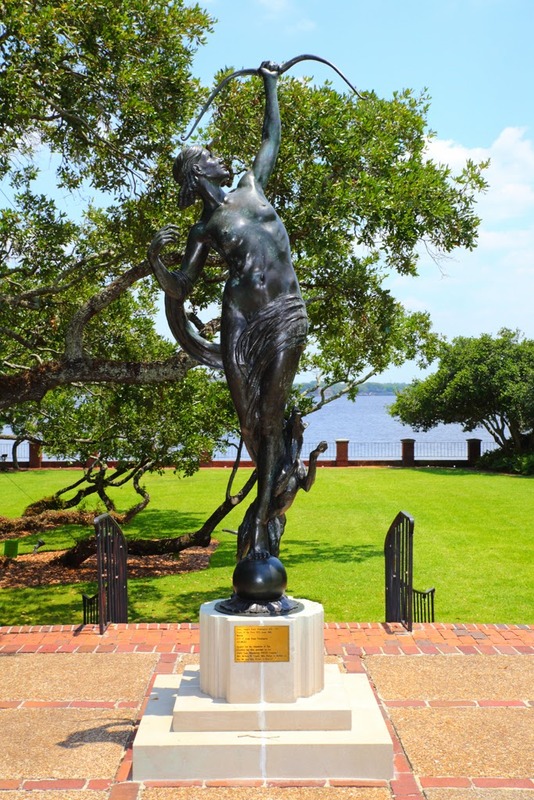 Diana, the goddess of the hunt, at the Cummer Museum of Art and Gardens in Jacksonville, Florida. The last day of Bike Week caught our arrival in Myrtle Beach, South Carolina. 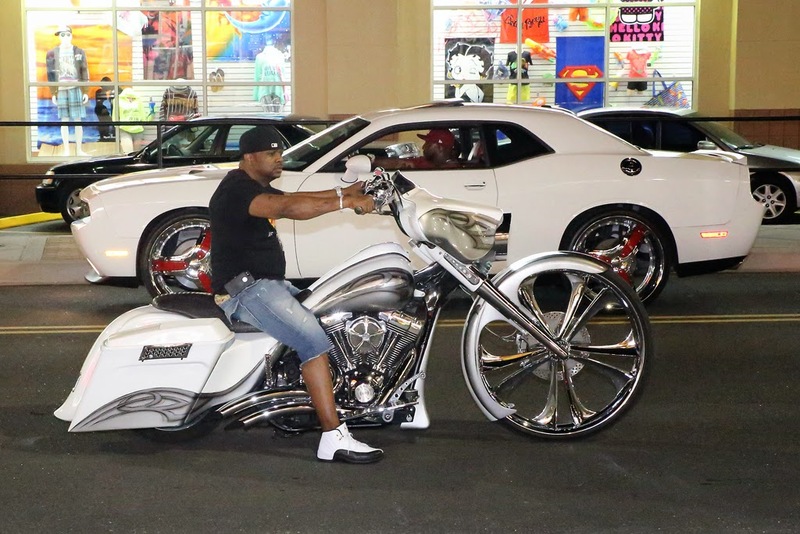 Its streets were filled with people riding big motorcycles, enjoying the delightful weather, and partying. Patience was required to drive the one and half miles from our hotel to the local seafood restaurant. Yet in spite of all this crowd in the city, we had an enjoyable and relaxing time at the beach with its fine sand and shallow slope. The ocean waves were gentle. One could walk quite a distance out to sea. My sister-in-law, her husband and 2 nephews from Indiana joined us. 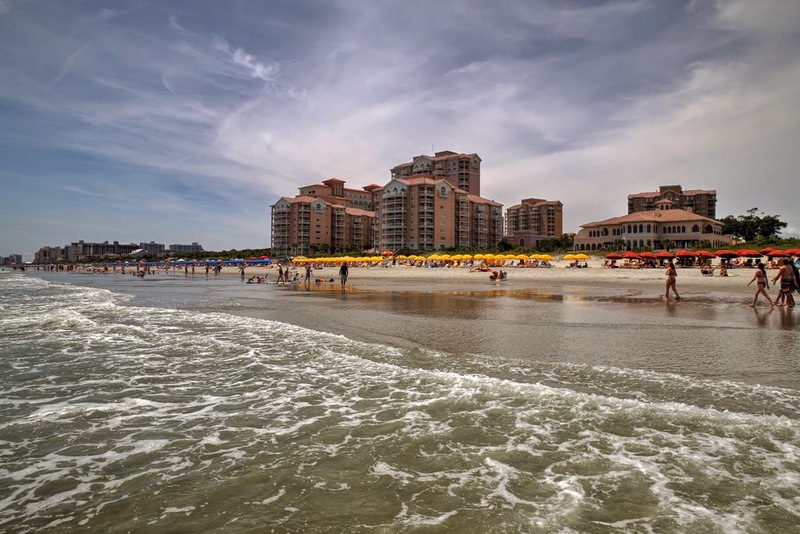 Their experience from their previous trips to Myrtle Beach helped us savor this locale much better. Custom motorbike in Myrtle Beach, South Carolina. A few drops of rain welcomed us to Washington, DC, a nice change to the many days of sun since our departure from Miami. Our time here was filled with visits to the US Capitol, the Library of Congress, the Lincoln Memorial, the Vietnam War Memorial, the World War II Memorial, the Smithsonian Air & Space Museum, and the US Botanical Garden. Every one of these places was impressive in its own way. A person would need at minimum one full day to fully appreciate each of these great institutions. 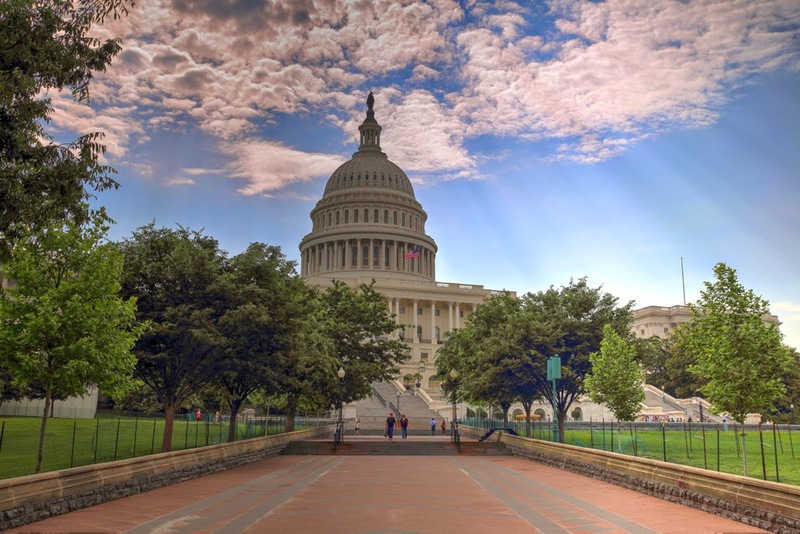 Our few days in the Nation's Capital were simply not enough; we had to miss many attractions. The replica of the Lunar Module of Apollo 11 recalled my fascination and admiration of the space program and the successful landing on the moon. 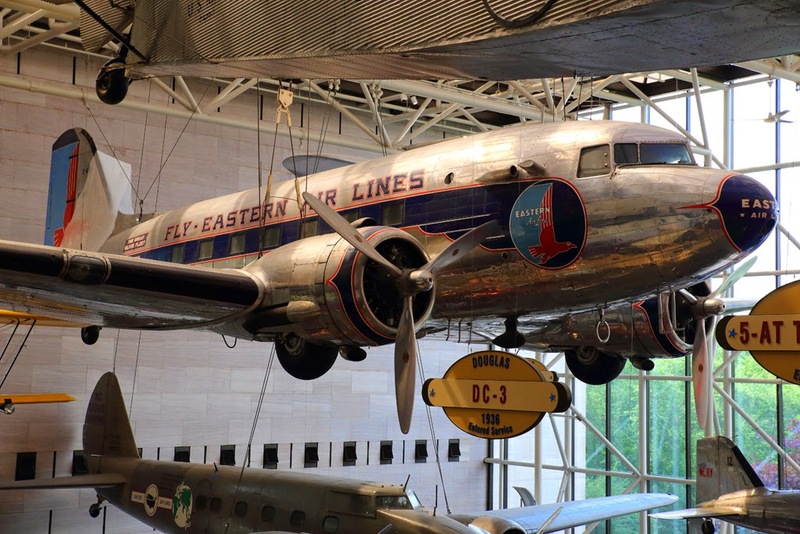 The DC3, the civilian version of airplane without which the invasion of Normandy in 1944 would be impossible, also brought back fond childhood memories of trips taken with my parents between Da Nang & Saigon. 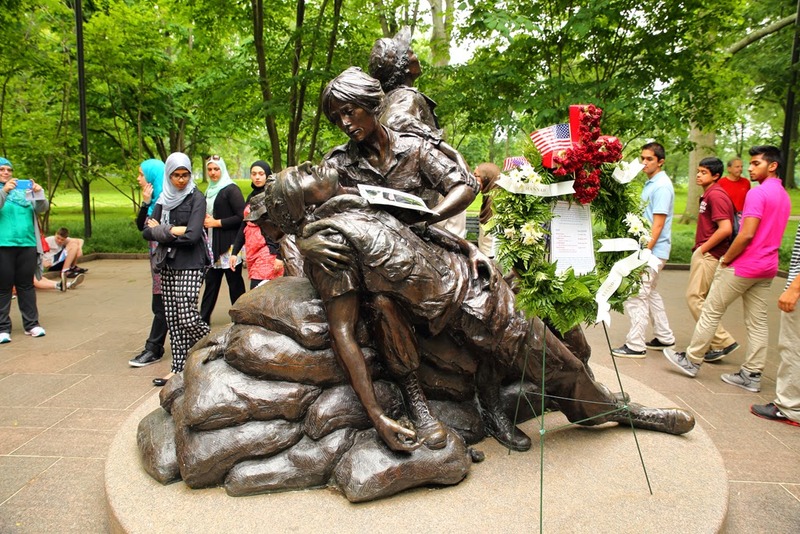 Vietnam Women's Memorial in Washington, DC. Douglas DC-3 at the Smithsonian National Air & Space Museum in Washington, DC. The last city of our journey was New York City. 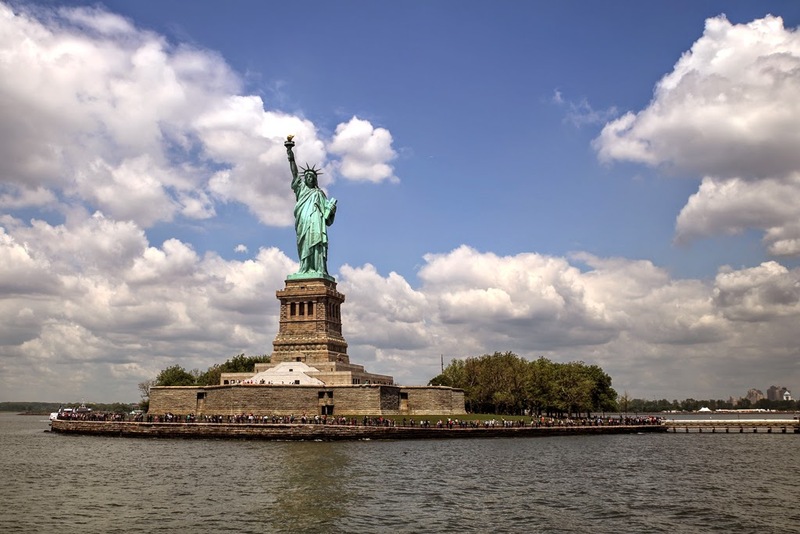 No visit to the Big Apple would be complete without seeing Lady Liberty, being in Manhattan and Time Square, petting the Charging Bull of Wall Street and walking on the Brooklyn Bridge. 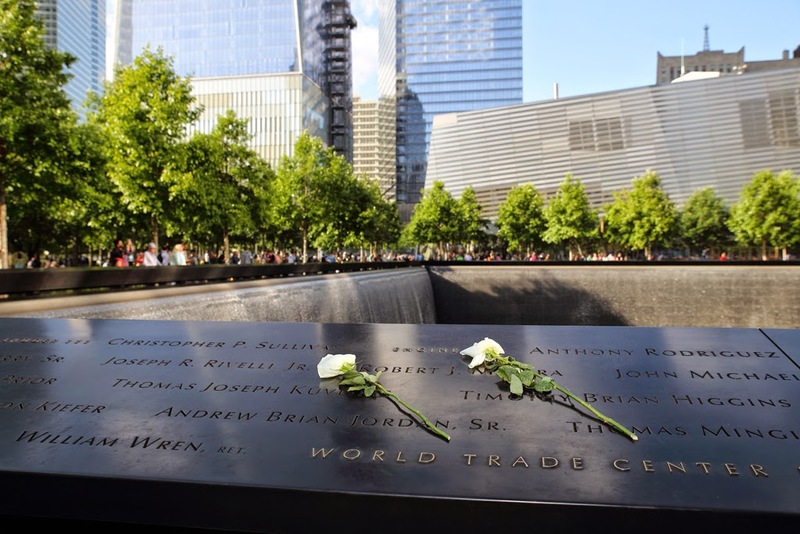 We paid our respects to the victims of the horrible attack on September 11th, 2001. The visit to the National September 11 Memorial was a very humbling and sobering experience, and highly recommended to everyone. But learning about the survivor tree and the sight of the new World Trade Center, also known as Freedom Tower, was very uplifting. Statue of Liberty on Liberty Island, New York. National September 11 Memorial in Manhattan, New York City, New York. We met up with another long time friend, his spouse, their daughter and her fiance, and enjoyed several meals with them. We had fun visiting Chinatown and thank them for spending time with us. 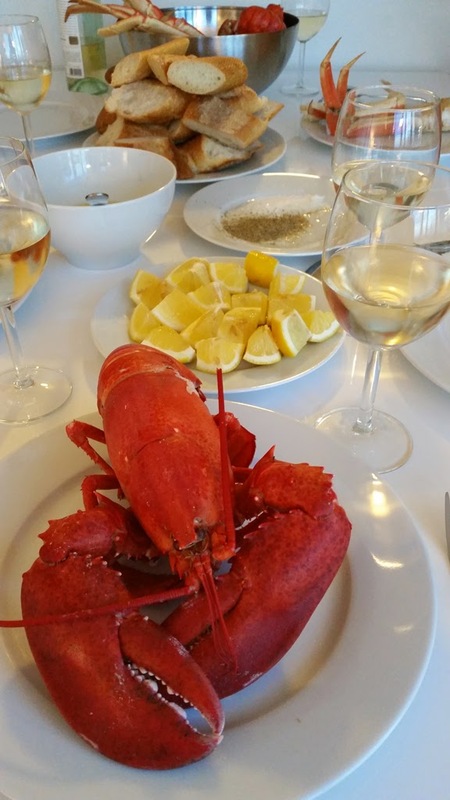 Our last evening in New York City, my wife bought fresh live seafood which she expertly cooked at our rental apartment. This dinner was simply superb. The next day, after checking out from our rental flat, we had the privilege to meet and enjoyed a wonderful brunch with the family who first hosted our now college graduate at the charming restaurant in mid Long Island. Memories, made during this trip which lasted two weeks, delightful and treasured forever. Naturally, the majority of pictures taken during this unforgettable trip are private. But many are at https://picasaweb.google.com/108013863525571472697/140515EastCoastScenic#. And as always, your comments and critiques of any part of this blog are welcome. This business trip to the capital of California was a short one. Completing my assignment ahead of schedule allowed me time to visit Old Sacramento during daylight hours. The Cathedral of the Blessed Sacrament was my starting point. It is a beautiful church, with a hexagonal altar. Cathedral of the Blessed Sacrament in Sacramento, CA. Inside the Cathedral of the Blessed Sacrament in Sacramento, CA. 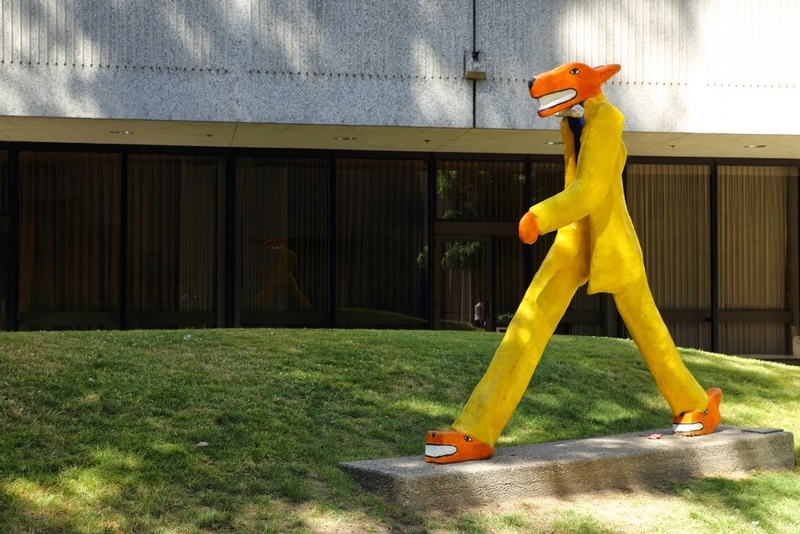 From there, I wondered about downtown area and happened upon some whimsical sculptures near the convention center. Backtracking a bit, I headed to Old Sacramento. 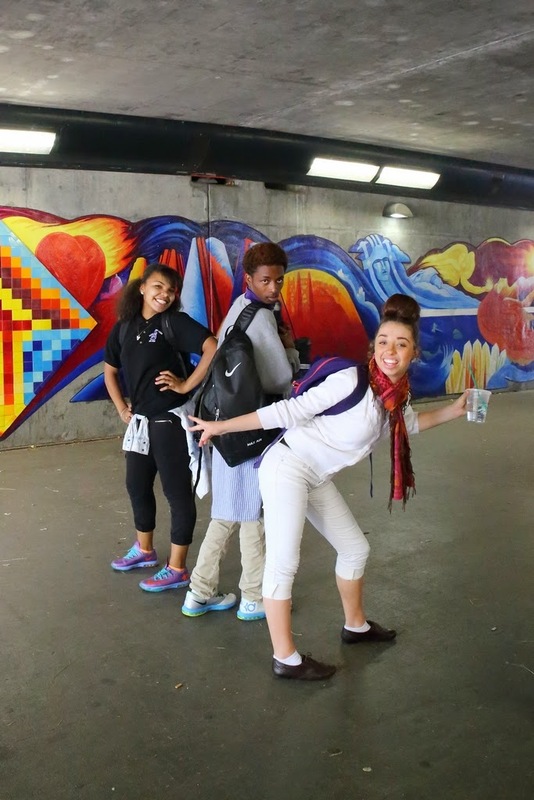 The tunnel under the highway had a mural depicting the interesting history of this place and some colorful artwork. A group of young people passing by agreed to playfully pose for me. Sculpture near Sacramento Convention Center. The way to Old Sacramento, CA. Posing on their way to Old Sacramento, CA. 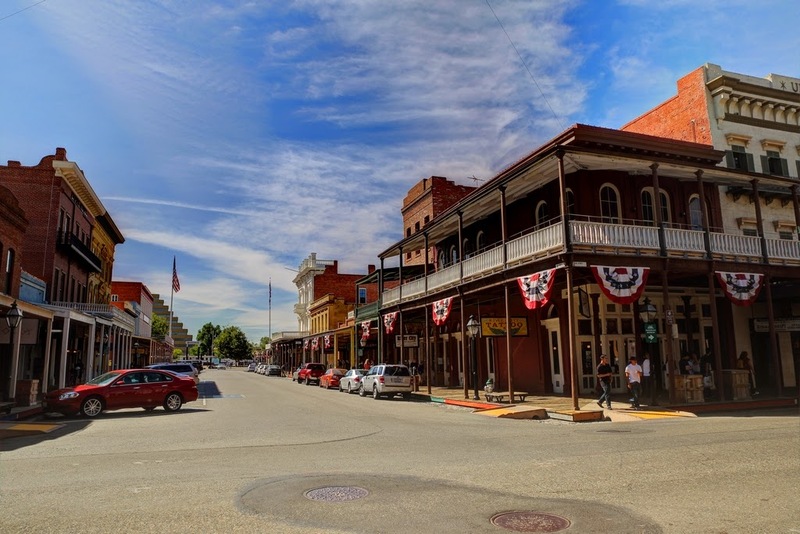 Old Sacramento is a section of this city intentionally kept frozen in the time of the Old West Gold Rush area, with many restaurants and charming shops. As I strolled around, another group of young people initiated a conversation with me, thinking I was a journalist. That interaction was fun. After grabbing a quick shot of the Delta King, it was time to bid farewell to the capital of California. Having fun in Old Sacramento, CA. 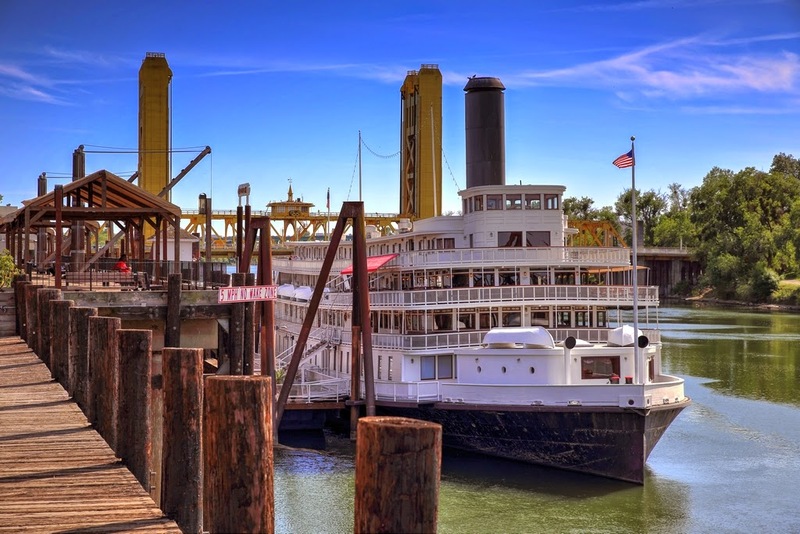 Delta King with the Tower Bridge in the background in Old Sacramento, CA. 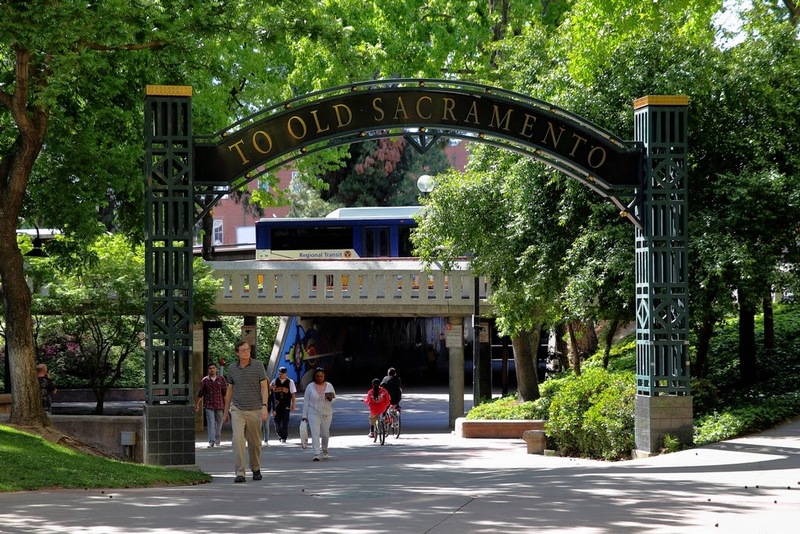 My journey to Sacramento this time, while short on time, was full of fun, especially the interactions with young people of or visiting the city. A few more pictures of Sacramento are at https://picasaweb.google.com/108013863525571472697/140421Sacramento. As usual, this trip was made possible by the hard work of many colleagues. It is my sincere hope that you enjoy this blog. Your comments and critiques are solicited and welcome. 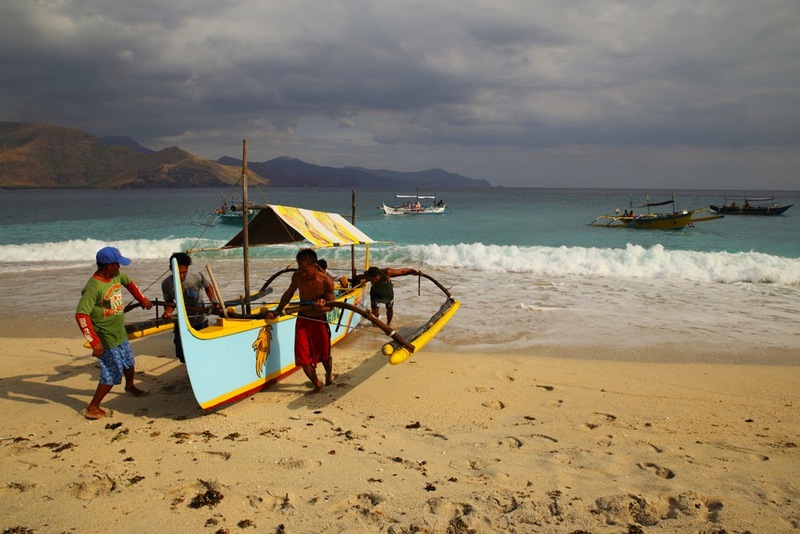 A family emergency delayed my business trip to Central Philippines. My sincere appreciations go to all my colleagues in dealing with customers to reschedule this engagement and well as many other assignments. 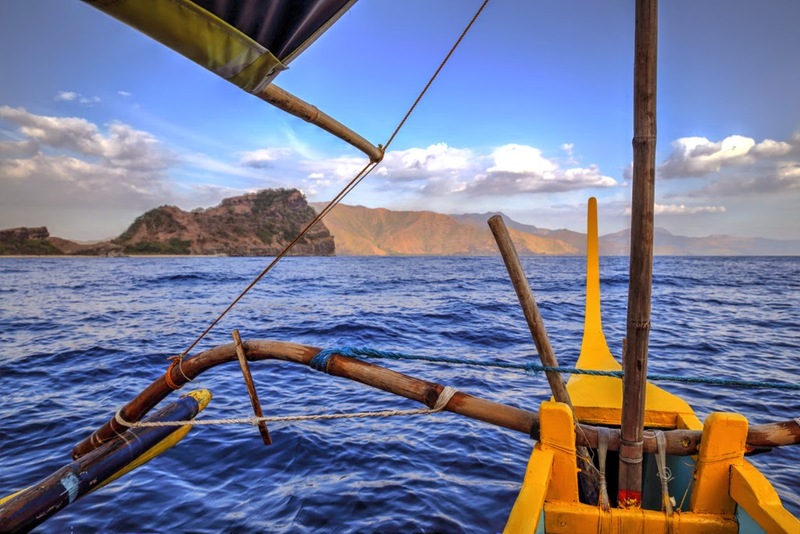 This journey to Central Philippines also brought back good memories of my travel to the same location for the first time back in January 2013. This time though, I was by myself with well over 150 lbs (70 kg) of computer gears and workbooks. My stay in Central Philippines would last almost 2 weeks. On one of several flights between the US and the Philippines, a United stewardess gave me many useful tips about Central Luzon, her home area. I arrived in Manila close to midnight local time. The hotel I stayed at was about 67 miles (110 km) northeast of the capital of the Philippines. As we got to Angeles City, the taxi driver got a bit lost. I took out my iPhone and got direction. The taxi driver was very impressed by the GPS of the smartphone. His facial expression was priceless. It was his first positive experience with something we take for granted. 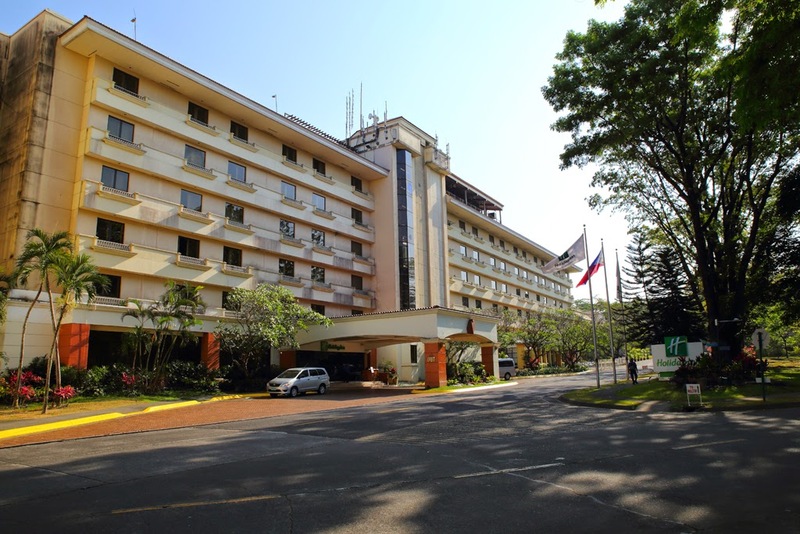 Holiday Inn at Clark Field, near Angeles City, The Philippines. The majority of my time in Central Luzon was spent at work. A colleague who was there on a longer term assignment, provided me great assistance. For dinners, we tried out regional and international cuisines. I was introduced to pinakbet - a local dish with bitter melon, anchovy paste, chicken, shrimp and other vegetables. It was surprisingly good. 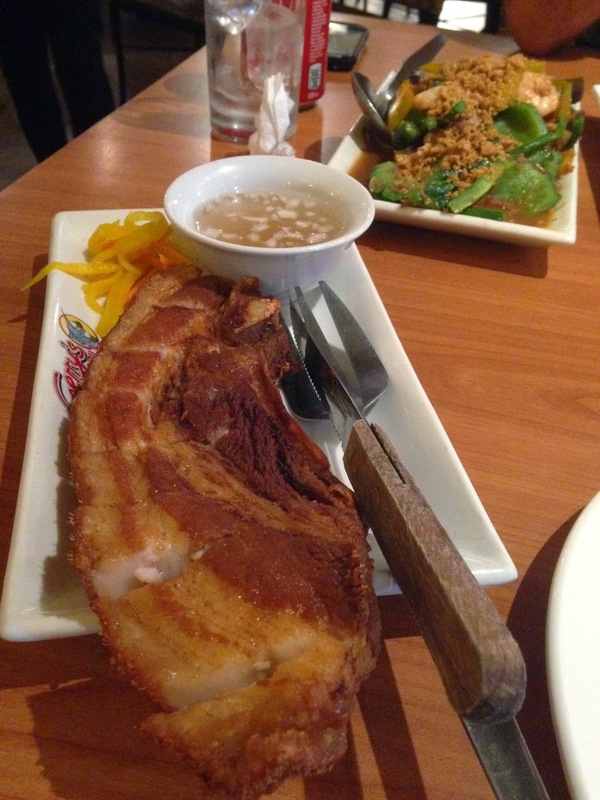 Foreground: fried pork belly; Background: pinakbet. Unlike my visit here over a year ago, the local people I worked with could not find any balut. That was a disappointment. But every morning I was greeted by the wonderful staff of the hotel. And the native fruit and Filipino food they served were excellent. Saturday was a welcome break. But instead of giving sleep a chance to reset my body clock, my colleague & I visited several sites in Central Luzon. Our first stop was the Capas National Shrine, a memorial to Filipino and American soldiers who perished during the Bataan Death March. 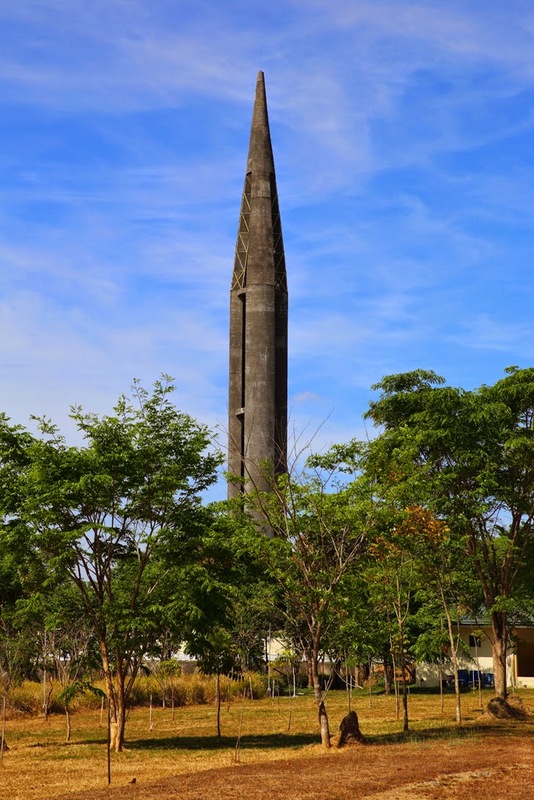 There was a very tall obelisk, surrounded by murals filled with names of the victims. Capas National Shrine, near Tarlac City, The Philippines. 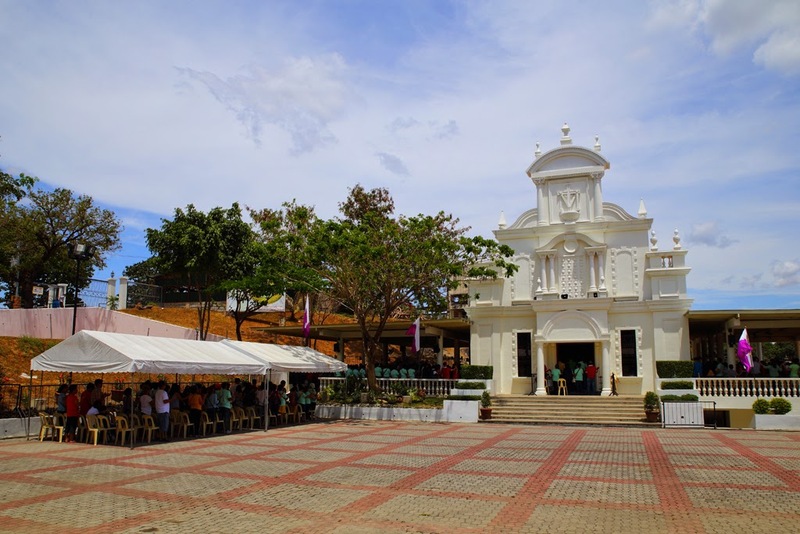 The drive to the Monasterio de Tarlac took us through beautiful countrysides and quaint villages. There were moments I wished I could stop and talk to the local people. The Monastery is built on a hill top. It was a beautiful complex. 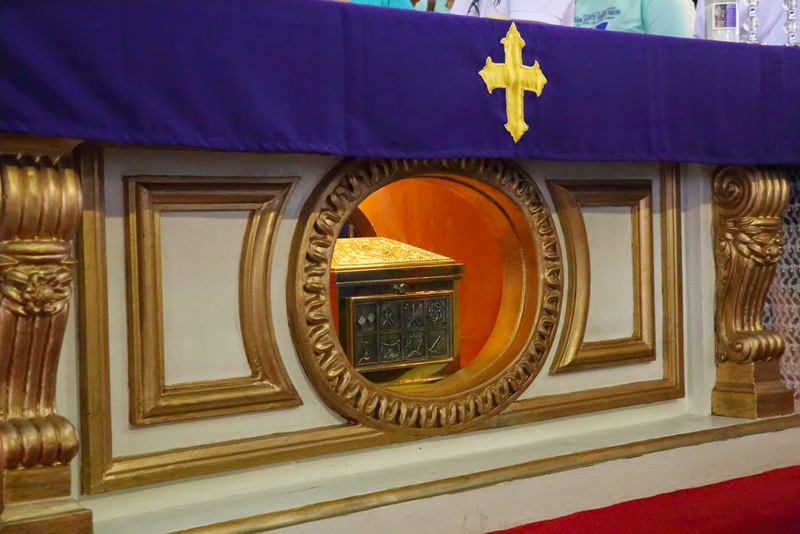 Its claim to fame was an Arquetta containing relics of the Cross on which Jesus Christ was crucified. After a solemn service, the faithfuls lined up to touch this artifact. Instead of standing in such long line, I sneaked in through the exit, took a quick shot of the Arquetta, and promptly retreated. The Arquetta of the Monasterio de Tarlac. My colleague and I went on to search for a waterfall, touted by a tourist website. When we came to the village closest to it, we stopped at a police station for direction. The local officer gladly helped us out but also warned us of potential danger such as kidnapping by the NPA (New People's Army). Not wanting to take that kind of risk, both of us decided against going to the waterfall. On our way back to Angeles City, we had an early dinner at the Isdaan Floating Restaurant just outside of Tarlac City. 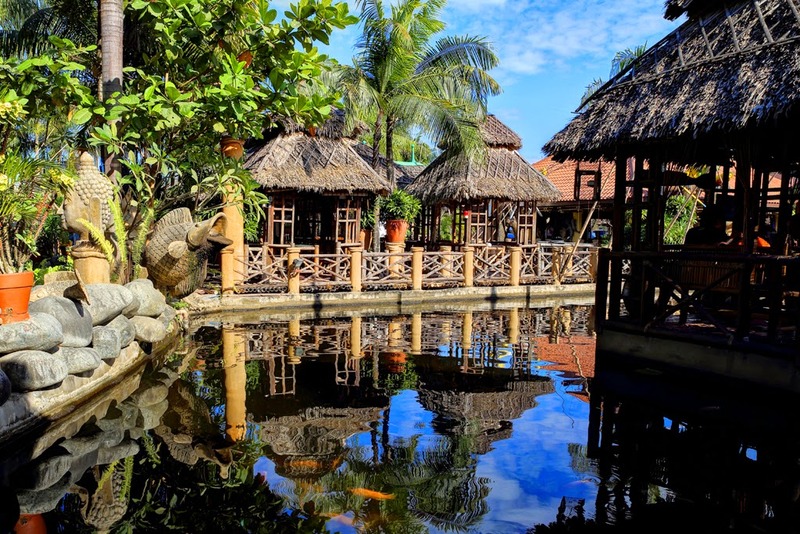 Isdaan Floating Restauant in Tarlac City. Sunday took us to Subic Bay. Along the way, we saw advertisement for Zoobic Safari. So, we went there. Zoobic Safari was an old fashion zoo. A guided tour took us through many exhibits; some were interesting, others not so much. Its highlight was to be a trip in a vehicle through the enclosure of tigers and lions. We were asked to buy meat to feed them. We were herded into a jeepney with strong metal mesh covering windshield, windows and doors. Going through the gate of the enclosure felt like being in the movie "Jurassic Park". Once inside though, lions and tigers lined up on right side of the vehicle. A member of the staff in the jeepney fed them chicken parts through the metal mesh. 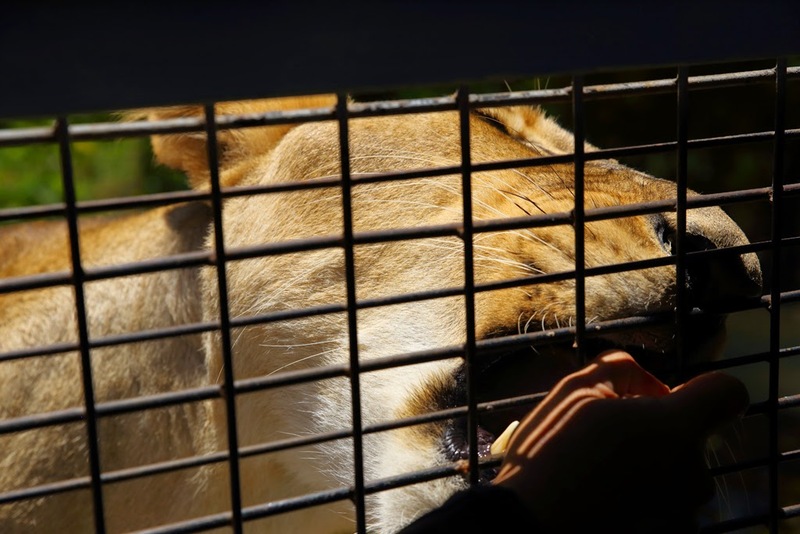 A magnificent lioness eating hand-out food at Zoobic Safari. 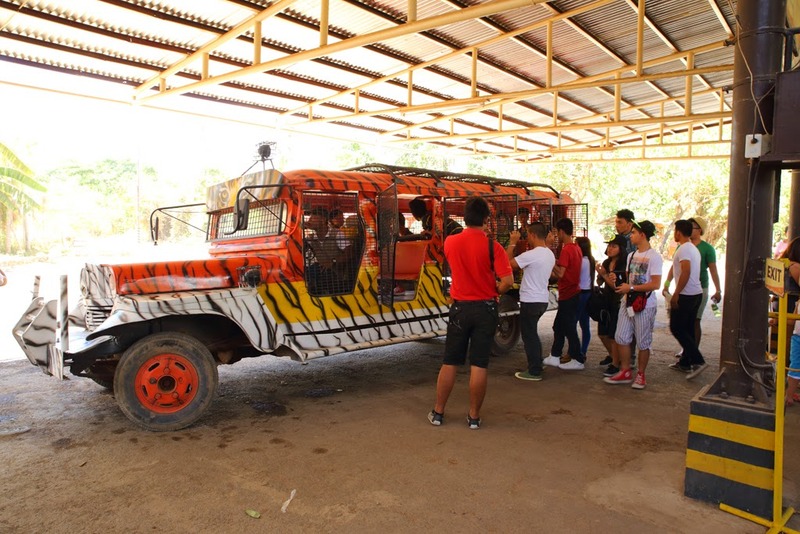 Loading visitors into a modified Jeepney at the Zoobic Safari. 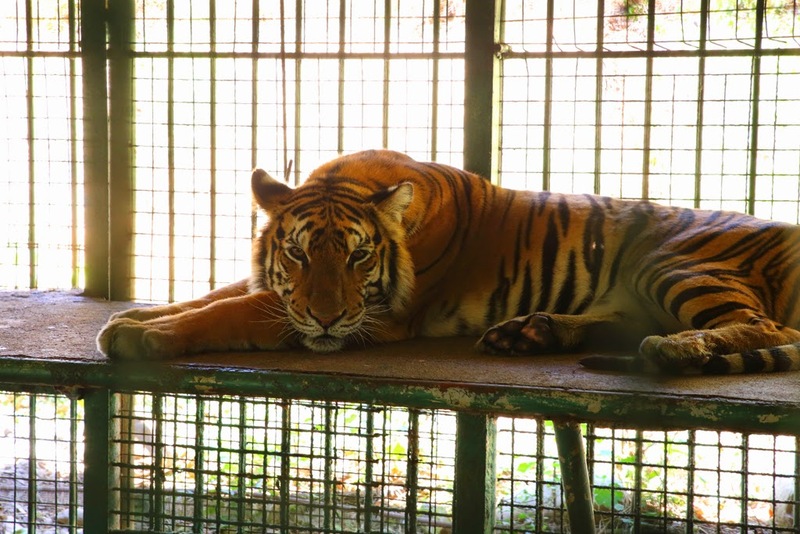 At another part of this zoo, we were led to small cages containing bored tigers. Somehow the sight of these majestic animals reduced to begging for food and being imprisoned in tiny cells saddened me. Yes, I had been to many zoos before. Each time, my enjoyment of wild animal in captivity lessened. But that was just me. Other guests of Zoobic Safari enjoyed their time there. A caged and bored tiger at the Zoobic Safari. After the zoo, we drove to Pundaquit, a seaside village about 1 hour northwest. Along the way, we got lost. A very nice local man let us follow him until the intersection where our paths separated. Then he pointed us to the correct road. The beach there was clean and nice. We hired the owner of a nice outrigger to take us to Capones, a small island nearby. The beach on Capones was beautiful; the sand was smooth. The water was great. We also sailed around Capones. Beaching our outrigger canoe on Capones Island. 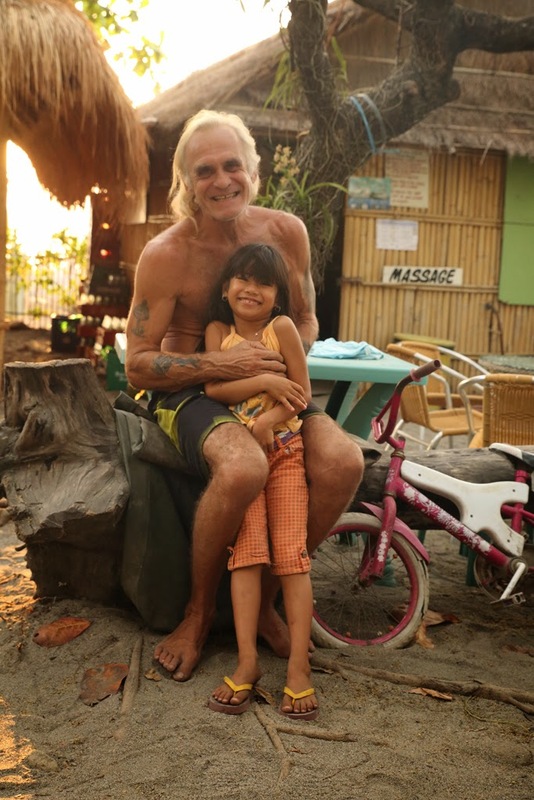 Back at Pundaquit, I met Kevin, an American expatriate, and his daughter Micca. Conversing with him was a treat. I wished Kevin the very best in life. Kevin and Micca at the Pundaquit Sun & Surf Resort. The Philippines is a very beautiful country and Filipinos are wonderful people. The fond memories I have of this great place are in part built with my colleague. And until our paths cross again, I bit him success and happiness. I am thankful of all my co-workers whose effort brought about this fabulous opportunity. My appreciations also go to my lovely wife who waited so patiently for me while I traveled the world for my job. A few more pictures are available at https://picasaweb.google.com/108013863525571472697/140315PhilippinesScenic. I am grateful for your visit and, as always, solicit your critiques and comments. My first business trip of 2014 was to India. It was the result of very hard work by colleagues. My first full day in wonderful India was its Republic Day, a major holiday. The Prime Minister of Japan was the guest of honor of this year's celebration. These two facts were cited by the hotel staff as reasons for staying indoor to enjoy the television coverage of the parades and festivities. Obviously, they were concerned about road blockages and the very tight security all around New Delhi. It was with deep disappointment that I decided to drop my intention to go to the iconic Taj Mahal. But I insisted on visiting a few sites on east side of the capital city, since they would be outside of the security zones. The driver assigned to take me was very courteous. The first place I visited was the tomb of Isa Khan Niazi, who was a nobleman in late 15th to early 16th century. The hexagon building containing the grave was quite impressive and sat in the middle of a garden surrounded by a high wall. To one side of it was the ruins of his mosque. Right next door was the grandiose Humayun's Tomb. It was a stunning red stone building surrounded by a large park. 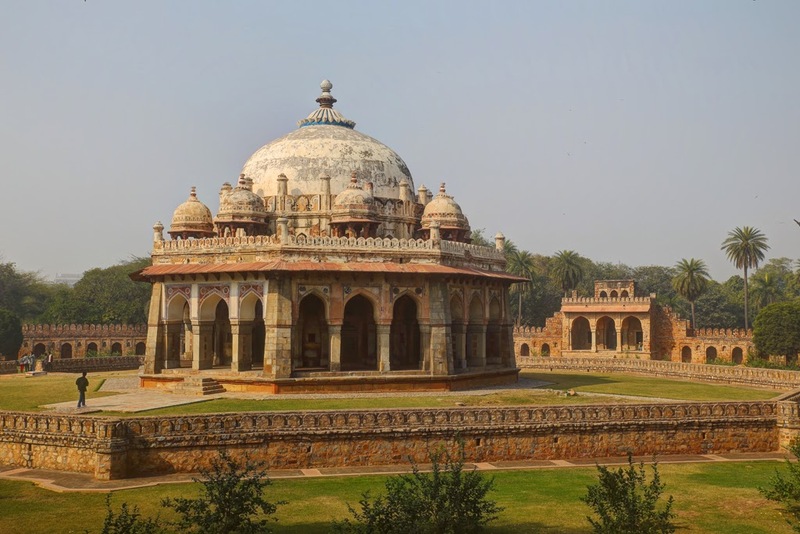 It was the first garden-tomb in India and is now a UNESCO World Heritage Site. This edifice was said to be the inspiration for the Taj Mahal. Looking at it from the well kept garden, I could easily take it for a glorious palace, not a mausoleum. 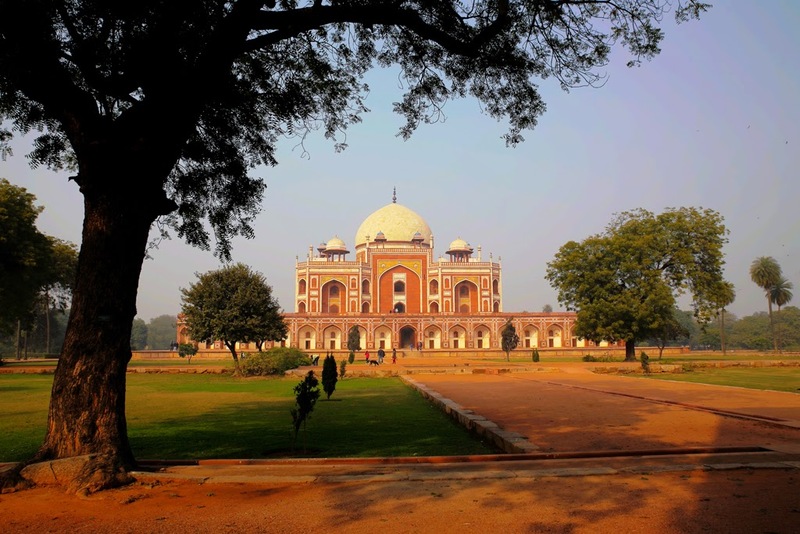 Humayun's Tomb in New Delhi, India. As the day progressed, more and more people showed up to enjoy the holiday at this stunning place. A group of uniformed personnel showed up. I later learned they were policemen and women participating in the parades of this Republic Day. Policewomen at Humayun's Tomb in New Delhi, India. The next place my driver took me to was the ISKCON Temple of the Hare Krishna faith. Unfortunately, the main building was closed; only its pretty garden was open to the public, which was filling up at a good pace. 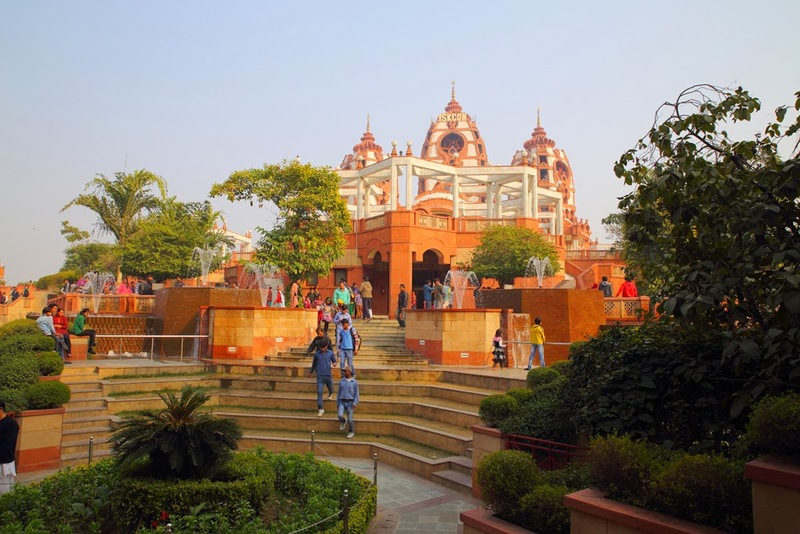 ISKCON Temple in New Delhi, India. By the time I reached the beautiful Lotus Temple, the line of people waiting to get through security at the gate was extremely long. Security was very tight; the line progressed slowly. I opted to photograph this elegant structure from the street and over the fence. 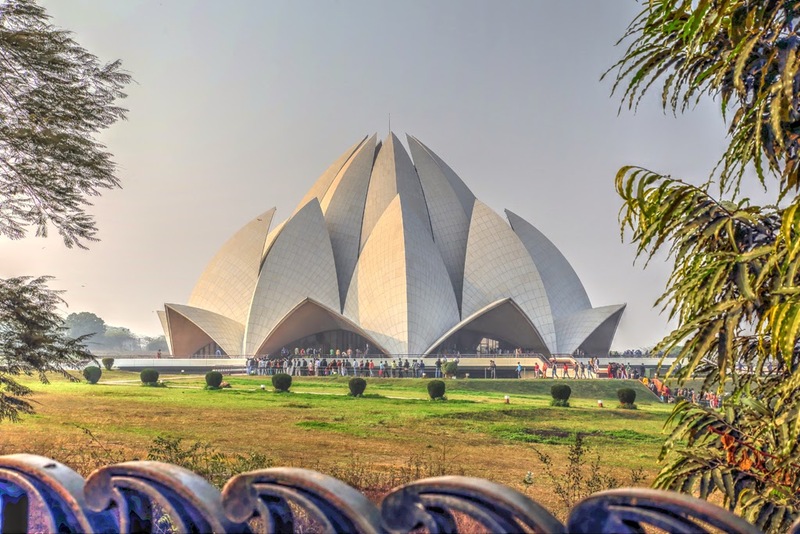 Lotus Temple in New Delhi, India. We attempted one more venue: the Akshardham Temple and its famous Musical Fountain. But the line of vehicles into this place was very long, the sun was setting fast, and the Musical Fountain was down for maintenance. It was time to return to the hotel. The first half of my week in India was dedicated to work. I then flew to Bangalore for the next half of my assignment. The rest of the week was committed to completing my duty. To the credit of the pricing policy of the airlines, a return flight on Sunday cost one third less than the one departing on Saturday. Even taking into account the costs of hotel and meals of one extra day, the savings were still substantial. 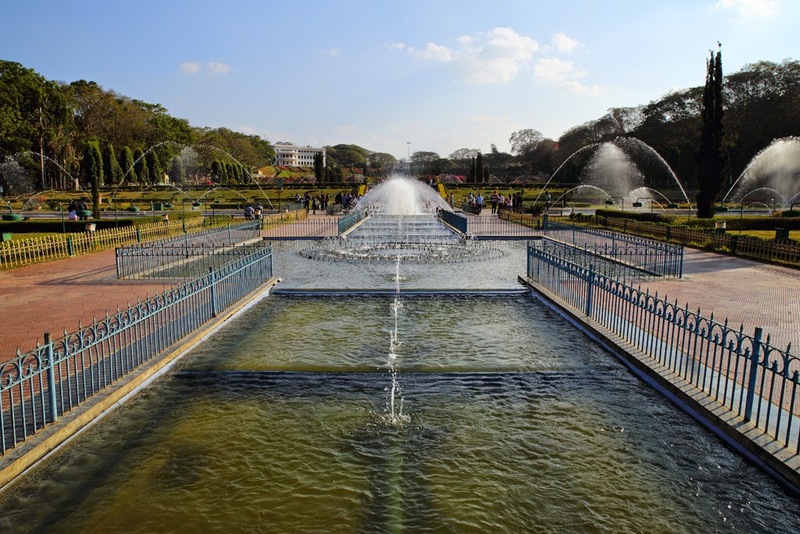 I was happy to oblige and took full advantage of the Saturday to visit the surrounding area of Bangalore. A tour guide picked me up from the hotel and drove me to Mysore, the capital of the area of many centuries. On the way though, he stopped by many temples and holy places of local people. I learned each region of India is essentially a "nation" with its own customs, religious beliefs, language and cuisine. 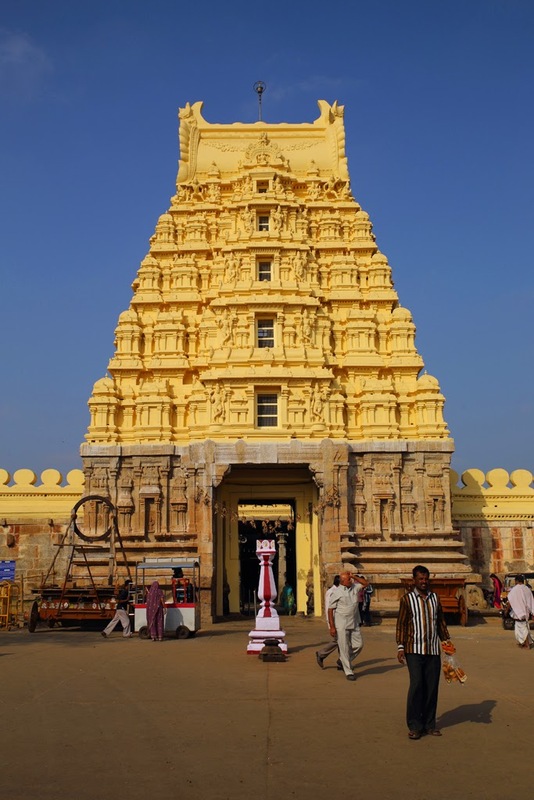 The first major temple was the Sri Ranganathaswamy Temple, north of the city of Mysore. The morning sun hit it just right, giving a golden glow. The artwork at the top of its gate was so intricate and admirable. As I visited the inside of the temple, I received blessing by one of the priests. By the time I exited, people were coming in to worship. Sri Ranganathaswamy Temple in the Mandya district of Karnataka state, India. The church of St Philomena in Mysore is a large and graceful structure. As I walked around, a group of delightful school children took notice and began to make noise. What a wonderful greeting. They were a fun bunch. I wished I had time to talk to them. 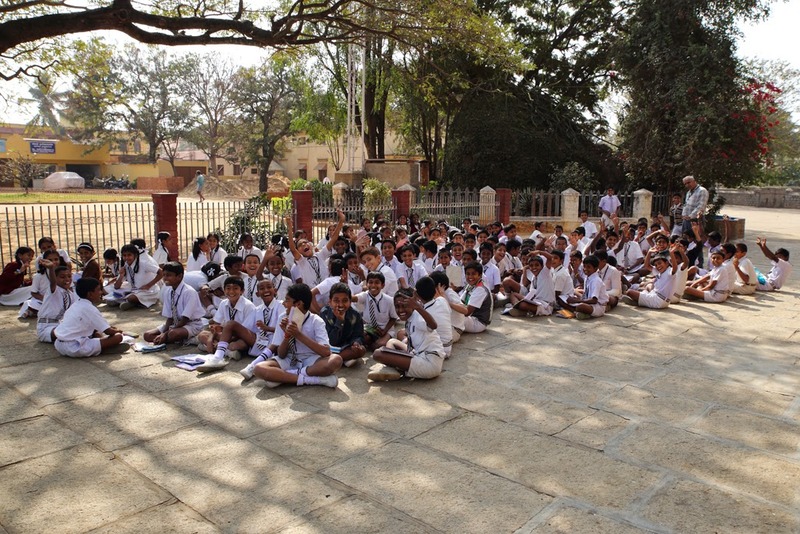 School children at the Church of St Philomena in Mysore, India. We then proceeded to the Chamundi Hill. At the top were the statue of Mahishasura, a deity of the area, and the Chamundeshwari Temple. The pedestrian road to the later was filled with vendors of fresh flowers, fruits and coconuts. Along the way, I witnessed people touching with reverence the free-roaming bovines and then caressing their faces as if they were washing away their sins. Such gesture, while normal to local devotees, is interesting to tourists like me, even though I understood these creatures are sacred to many Indians. 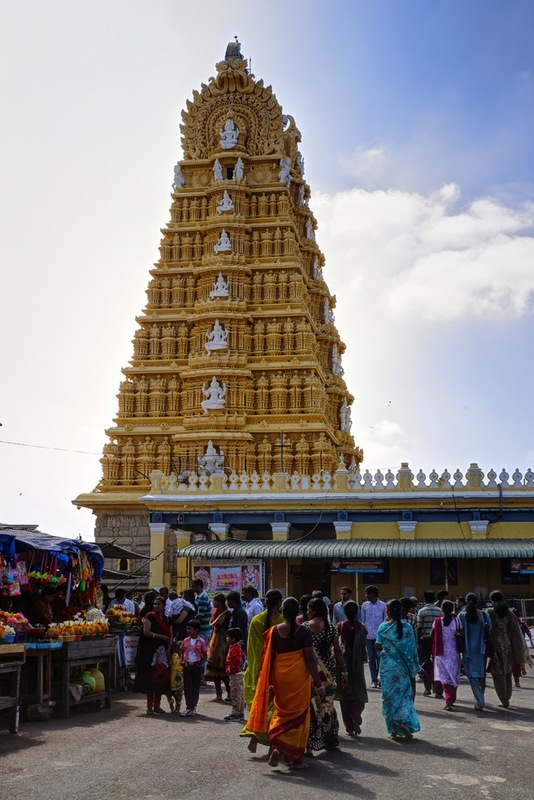 The Chamundeshwari Temple was filled with devotees praying and offering flowers, fruits and coconuts. Chamundeshwari Temple on Chamundi Hill near Mysore, India. After a quick visit to Nandi, the bull which served as the mount of Hindu god Shiva, the tour guide took me to visit the Mysore Palace. It was magnificent place. The line to get inside the palace was long. 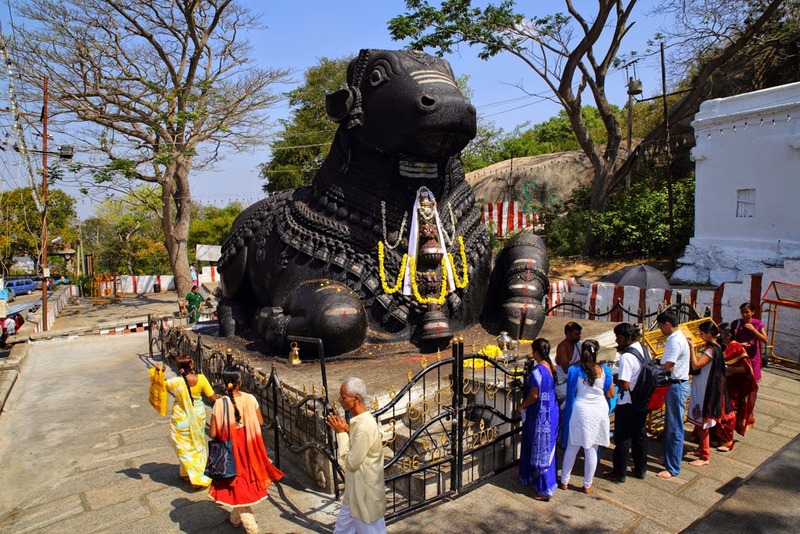 Nandi at Chamundi Hills in Mysore, India. 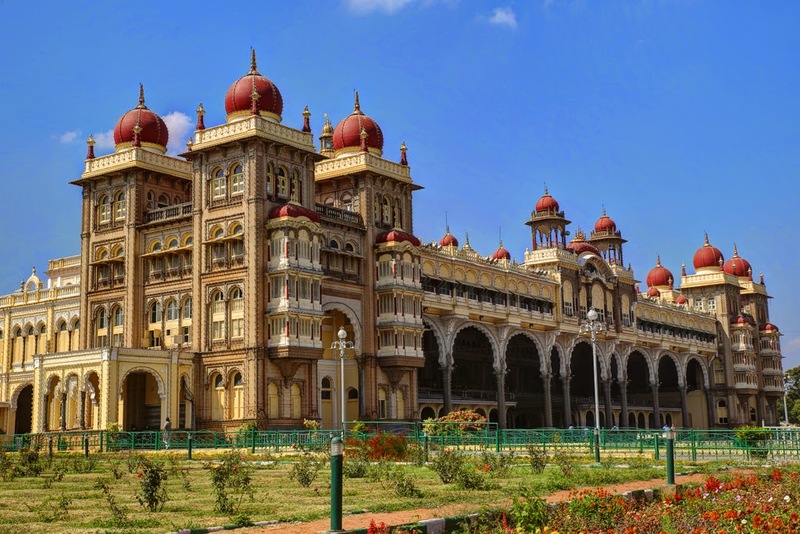 One among the many appealing features of the Mysore Palace is that every edge, door and window frame, and column is outlined with light fixture. The view of this palace at night, when all its lights are lit, would be breathtaking. But staying until sunset was not feasible for me at this time. On the way back to Bangalore, the tour guide took me to Brindavan Gardens at the foot of the Krishana Raja Sagara Dam. Since my flight home was scheduled to depart very late in the day, I decided to pay a brief visit to central Bangalore. I wanted to take an auto rickshaw to Cubbon Park. I consulted with the hotel staff ahead of time about the cost of such trip. This information was key when I negotiated the fare with the driver of the auto rickshaw. The ride on the auto rickshaw was noisy, interesting and fun. 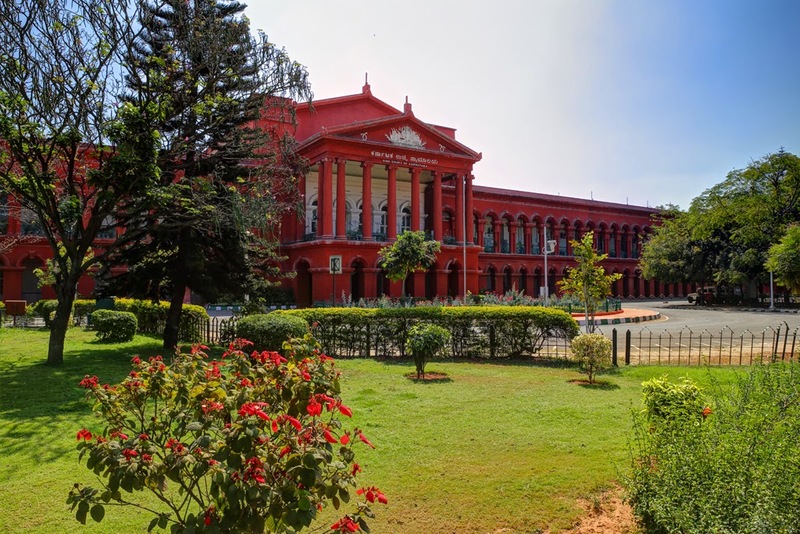 Next to Cubbon Park was a large red building which houses the High Court of the State of Karnataka. 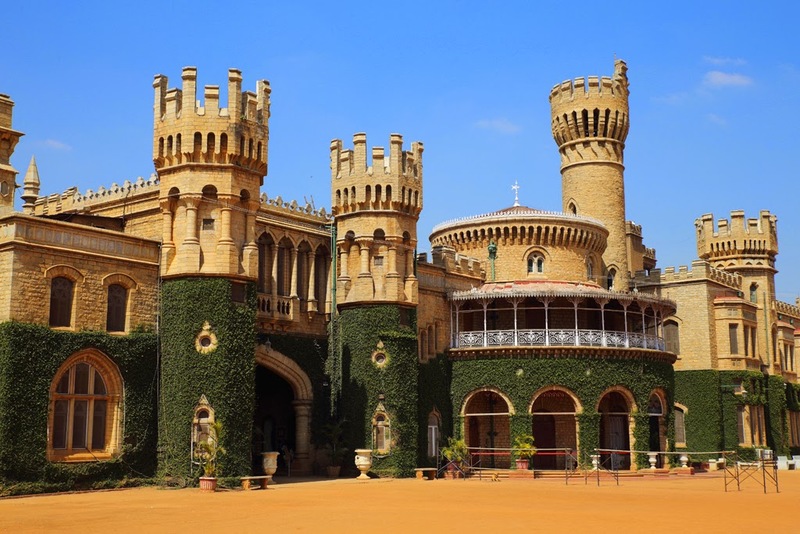 My last stop, before returning to my hotel to get ready for my flight home, was the Bangalore Palace. 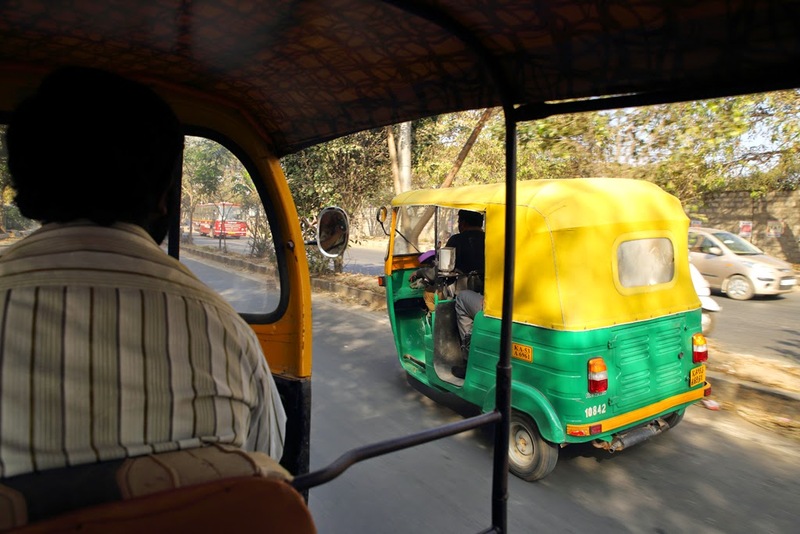 Riding an auto rickshaw in Bangalore, India. The High Court of the State of Karnataka in Bangalore, India. India is a fascinating country, with its multitude of cultures, languages, cuisines and customs. In the very short visit, I was only able to take in a brief glimpse of this beautiful country and wonderful people. More pictures are at https://picasaweb.google.com/108013863525571472697/140126India02#. I do hope I will have another chance to visit India in the future. And as always, I solicit your comments and critiques to help improve my blog. Until next time, I bid you a great day and safe travel.